The Sieckhaus family has traveled Interstate 44 between St. Louis and Rolla ever since Bob landed at Fort Leonard Wood as a 17-year-old Army recruit. As Rolla undergraduates, the Sieckhauses were active in fraternities: Bob in Pi Kappa Alpha, Tom in Phi Kappa Theta and Steve in Kappa Sigma. All three Sieckhauses went on to graduate school: Bob holds an MBA from Saint Louis University, Tom an MBA from the University of Missouri-St. Louis, and Steve a master’s degree in engineering management from S&T. Today they also share common ground as members of the Academy of Civil Engineers. “My father is extremely proud to have both of his sons involved in the academy,” says Tom. 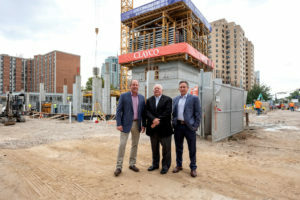 The Sieckhauses were recognized by the academy in April 2018 for their philanthropic leadership in supporting the Advanced Construction and Materials Laboratory with a $2 million donation from Clayco.